The Sandwich Atlantic Twinning Association is looking for digital photos of Sandwich for a joint website with Sandwich, UK. Please send any photos via email to dean@deancoe.com. Tea with Sandy Schrader from Sandwich, Mass. at The Salutation in Sandwich, UK with the Mayor & Mayoress, Deputy & Consort, Chair of Sandwich History Society and BASH members. — with Dave Batchelor, Rowan Frost, Amy Batchelor, Sonia Frost and Tony Cooper in Sandwich, Kent. Sandy Schrader from Sandwich, Mass. in the mayor’s seat at the Guildhall Courtroom, Sandwich, Kent. The Mayor seemed happy with the arrangement. — in Sandwich, Kent. WATCH Video on Twinning Charter with Sandwich, U.K.
Would you like to take part in the Sandwich twinning? Sign up as an epal! We are working with the people of Sandwich UK to create a network of email ‘penpals’ across the twin towns. 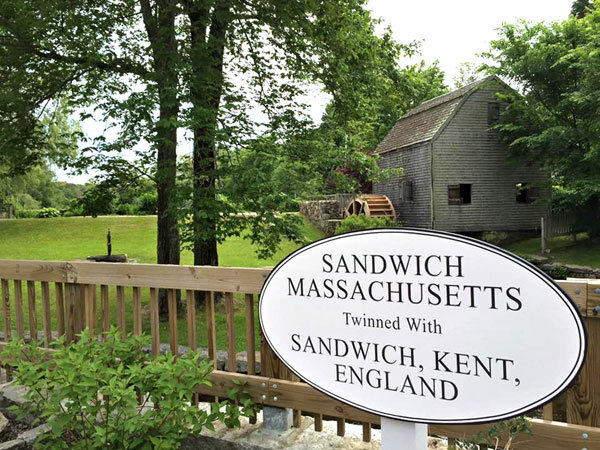 Sandwich, Massachusetts is named for the seaport of Sandwich, Kent, England. 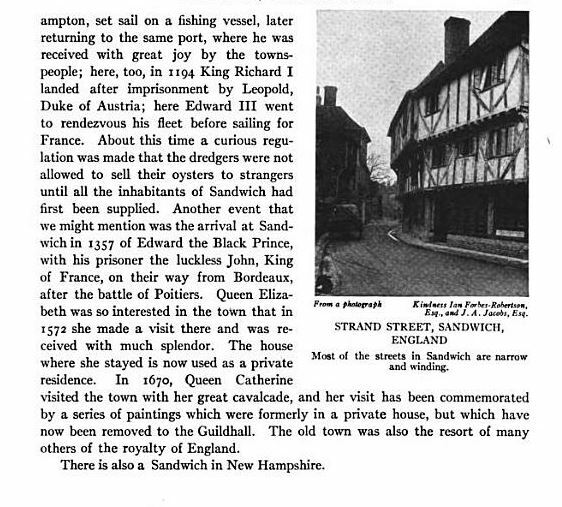 The name “Sandwich” comes from Old English (O.E.) Sandwic, and literally means “sand village,” “sandy place,” or “place on the sand.” The old English wic is a loan word from Latin vicus, which also gives us the word vicinity. 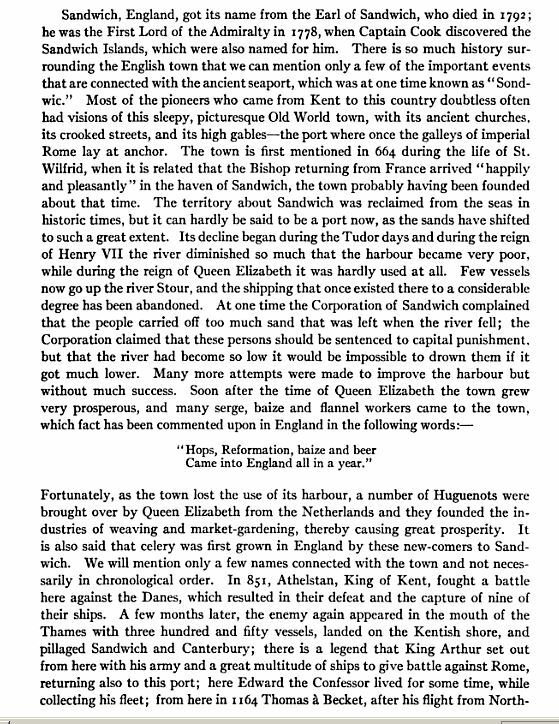 The word “sandwich” as an item of food came into being centuries later (we’ll get to that in a bit) . 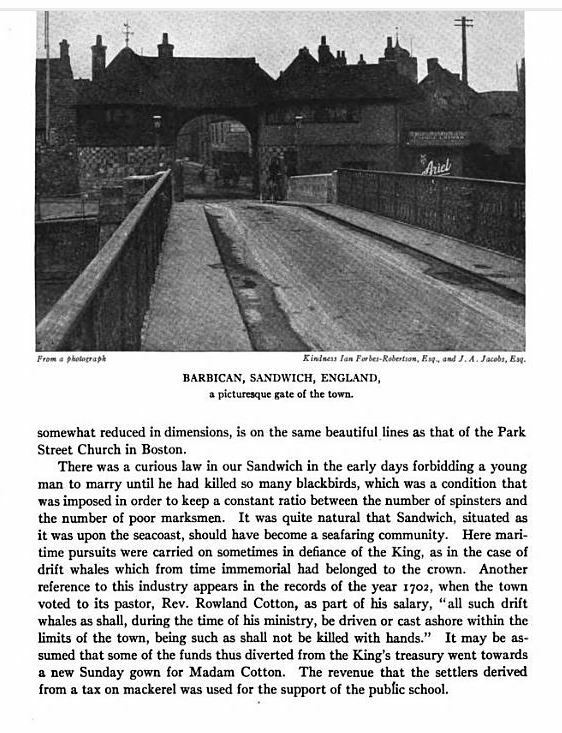 The first recorded mention of Sandwich in the United kingdom was around 664 AD but there was probably some kind of settlement in Roman times as the site is very close to a Roman Fort (Rutupiae). The seal for Sandwich in Kent, England had 3 ships with lion heads. 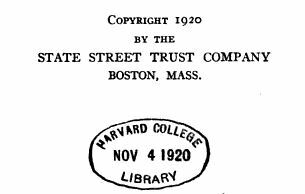 By 1900 all towns in Massachusetts were required to establish a town seal. 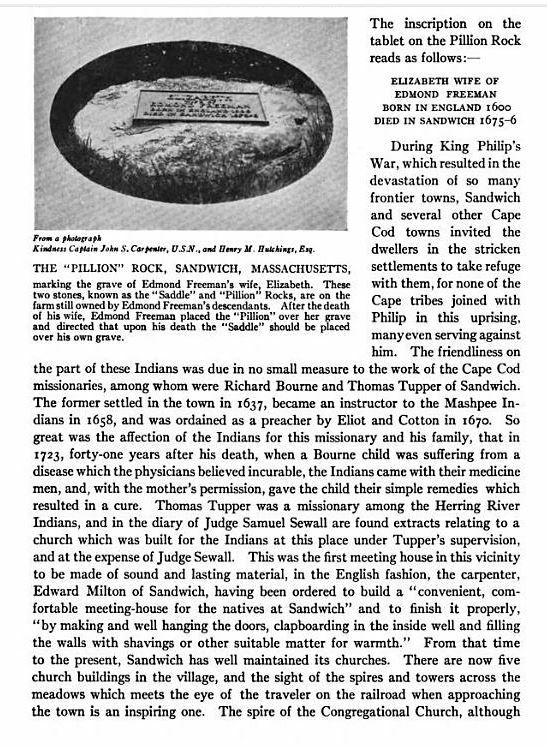 The design adopted for Sandwich, Mass. 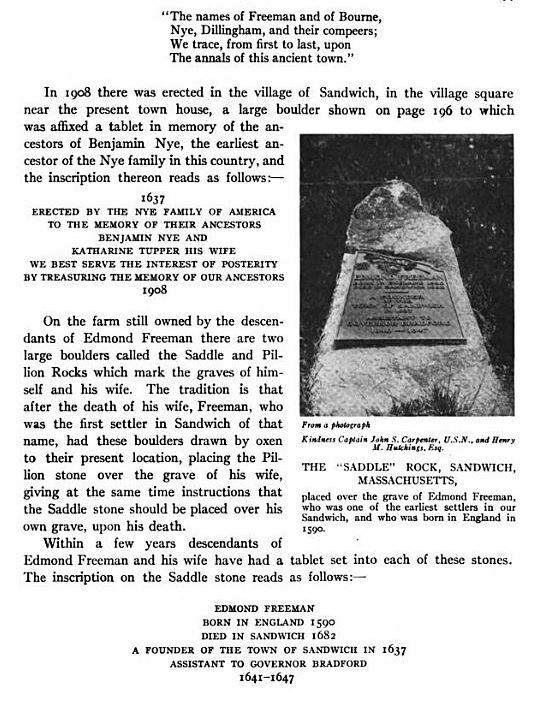 was proposed by Melanie Elisabeth Norton (who married Jonathan Leonard in 1898). She drew American eagles in place of the British lions. On the version of the seal shown here, those 3 blips on the ships don’t look much like eagles, but we hear from the Leonard’s grandson that the town is working on re-drawing the seal so the eagles can be more easily discerned. This phrase was also the motto of John William Montague (1718-1792), the 4th Earl of Sandwich, and is on the Montague family Coat of Arms. It is said that we get the name of the “sandwich” we eat from the 4th Earl. Legend has it that Montague was a hardened gambler and usually gambled for hours at a time at a restaurant, sometimes refusing to get up even for meals. He ordered his valet to bring him meat tucked between two pieces of bread so he didn’t need to bother with utensils to eat it. 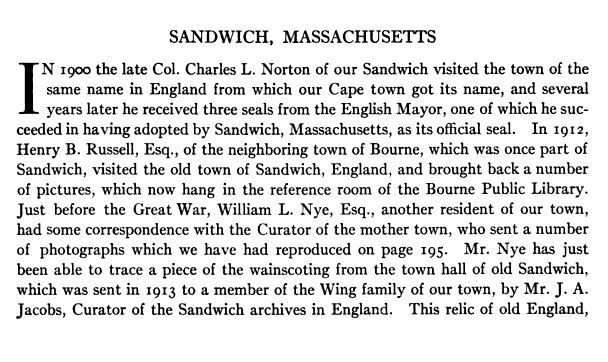 Because Montague was also known as the Earl of Sandwich, others began to order “the same as Sandwich!” And the name stuck. An alternative explanation is that the Earl invented it to sustain himself at his desk, which seems plausible since there is ample evidence of the long hours he worked from an early start, in an age when dinner was the only substantial meal of the day, and the fashionable hour to dine was four o’clock. 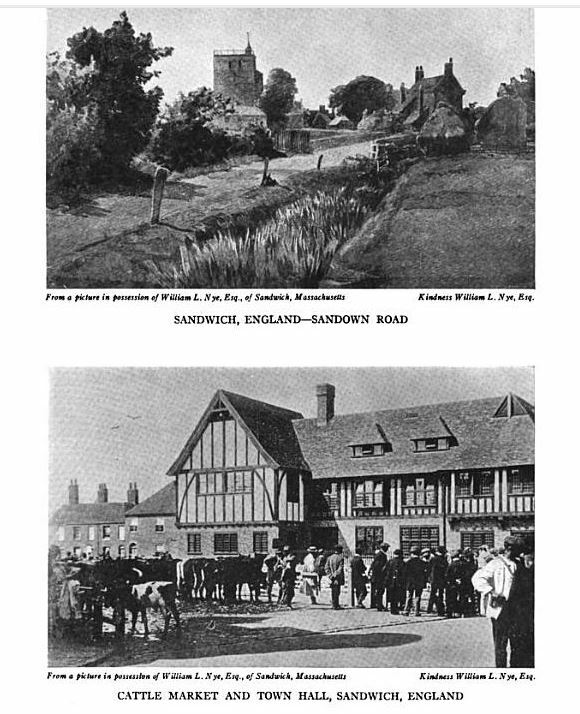 Note however, the family of the Earls of Sandwich has no real connection to the English town itself, only the title. 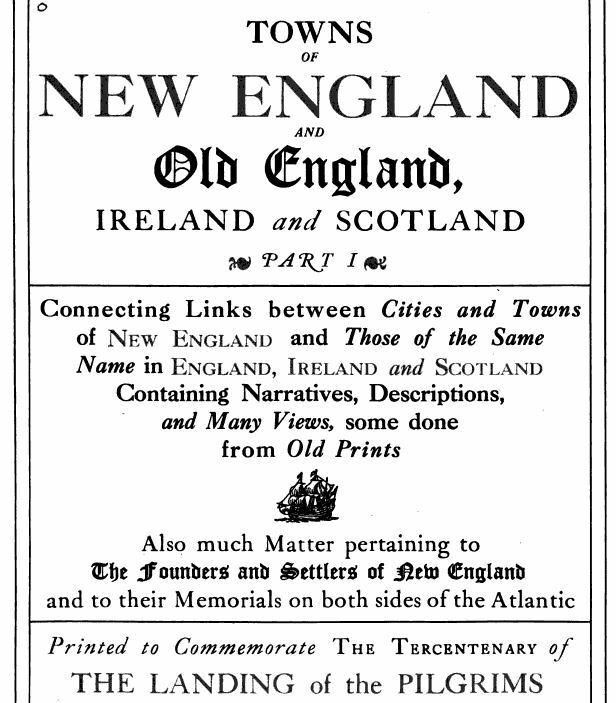 Apparently, the First Earl, Edward Montagu, originally intended to take the title of the Earl of Portsmouth—this might have been changed to honor the town of Sandwich, because the fleet he was commanding in 1660 was lying off the coast of Sandwich, before it sailed to bring Charles II back to England. We can be thankful the name was changed, otherwise we’d be eating Peanut Butter Portsmouths! 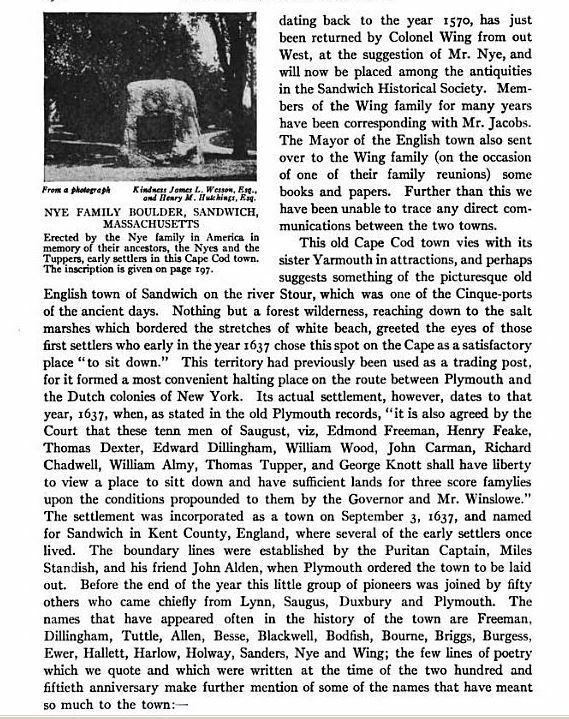 This entry was posted in Articles, History of Sandwich, News, Sandwich UK. Bookmark the permalink.